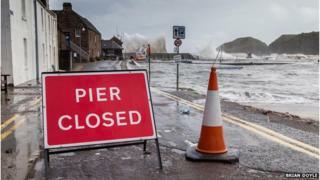 Some residents have been evacuated from their seafront homes in the Aberdeenshire town of Stonehaven due to flooding fears. Heavy rain along with rough sea conditions flooded parts of the beach area. Elsewhere, an elderly man had to be rescued from rising waters at the River North Esk by a helicopter. A number of flood warnings and weather alerts were issued as Scotland continues to be hit by severe weather. Police said about nine people had moved from ground floor flats at the Turners Court sheltered housing complex in Stonehaven. Sand bags have been deployed, and people warned to stay away from the harbour and beach area. The 70-year-old man had to be rescued from the river near Glenesk when he got into difficulty amid rising water while fishing. Police, the fire service and an ambulance crew were called to the scene a mile upriver from Gannochy at about 12:45, and a helicopter was brought in to winch the man to safety. The Scottish Environment Protection Agency (Sepa) said flooding was expected in Aberdeenshire, Tayside and Caithness, while alerts are in place for Dumfries and Galloway, Orkney and Shetland. The Met Office issued yellow warnings for wind and rain across north east Scotland right through the day. Traffic Scotland warned travel could be disrupted by the conditions. Sepa has issued warnings of expected flooding along the north Aberdeenshire coast, with low-lying properties between Macduff and Portsoy at risk at high tide and again in the evening. Train services between Dundee and Aberdeen were delayed due to flooding on the line in the area of Montrose. Sepa warnings were also issued for Finavon, Tannadice and Bridge of Dun in Angus, Helmsdale to Embo in Caithness and Sutherland, and at several points along the River Isla in Perthshire, including Blairgowrie and Coupar Angus. The Met Office warned of "severe gale force winds" across Shetland and Orkney, with gusts of up to 70mph expected along with large waves in coastal areas. A yellow "be aware" warning of "heavy, persistent" rain was also issued across Moray and Aberdeenshire, with up to 50mm expected to fall in easterly areas.